I was on my way out of town in search of adventure when a dragon roared above. I see him flying towards town so I head back. I make short work of it with some help of the town’s guards and I take my leave. Back on the road, just a short distance outside of town, I get ambushed by a bear. But this wasn’t just any bear! This was Bearacles, great king of the frozen north! After receiving a swift and merciless beating, I run back to town as fast as I can and the guards kill the bear for me. This entry was posted on Wednesday, November 16th, 2011 at 12:00 am and is filed under Comics. You can follow any responses to this entry through the RSS 2.0 feed. Both comments and pings are currently closed. The great Dragon slayer got beat up by a bear. 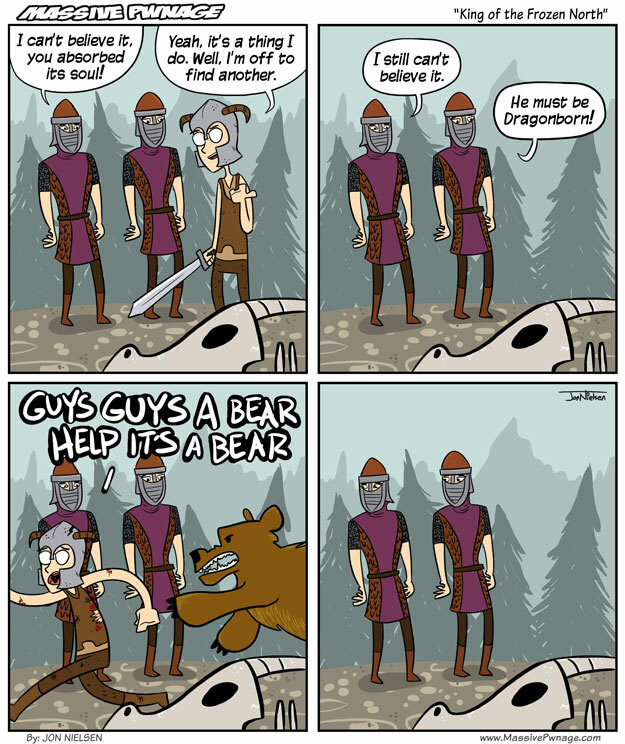 I was fighting a dragon the other day when two bears came upon me… i was more threatened by the bears, and for good reason. The entire dragon fight, i had to heal maybe, once, for about 10 seconds. After the fight, while dealing with the bears, i died incredibly fast and didnt have a chance to heal. If only you were the Bearborn. Or a Giantborn. I was on my way back to town with more loot than I could carry (houses don’t pay for themselves, you know!) when I chanced upon a dragon. Over-encumbered as I was I still managed to take it down. In the midst of the fight, however, I managed to enrage a giant. He, too, was a VERY difficult task, but sure enough I triumphed. As I started back toward town, I chanced upon a bear. Tell my wife I loved her.